After about 2 months delay from initial schedule, OpenSuse 12.2 finally arrived. During recent time, contribution to OpenSuse has increase a lot, so it is taking time review and accept/reject those changes, this is main cause of delay. OpenSuse is working on a mechanism to handle increased traffic. From the release announcement “The latest release of the world’s most powerful and flexible Linux Distribution brings you speed-ups across the board with a faster storage layer in Linux 3.4 and accelerated functions in glibc and Qt, giving a more fluid and responsive desktop. The infrastructure below openSUSE has evolved, bringing in mature new technologies like GRUB2 and Plymouth and the first steps in the direction of a revised and simplified UNIX file system hierarchy. Users will also notice the added polish to existing features bringing an improved user experience all over. The novel Btrfs file system comes with improved error handling and recovery tools, GNOME 3.4, developing rapidly, brings smooth scrolling to all applications and features a reworked System Settings and Contacts manager while XFCE has an enhanced application finder.” I downloaded KDE live image, now start testing. Installation went smooth without any issue all hardware detected on my Compaq CQ-62 laptop. This time I did not any warning for bootloader installation, previously I got ‘root partition is above 128GB’ for bootloader, because of that issue I did not install bootloader from OpenSuse. Thanks to Grub2 this warning no longer appears, so I went ahead and installed it and system booted properly and Linux mint from other partition is also added to the list. The installer interface is same as last version. It boots really faster, less than half time as compared to 12.1. OpenSuse 12.1 takes about 72 secs and 12.2 takes 30 sec. I disabled few services and it goes down to 26 secs. After installing vmware and virtualbox it went up to 40 secs, which is still better than 12.1’s 72 secs. 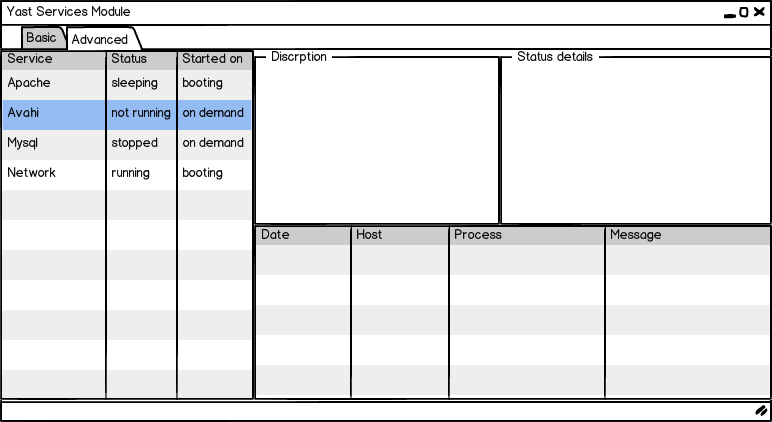 I need to find out the way to delay loading for vmware and virualbox modules loading. Anyway, I’m sure that people can reduce boot time to 12.2 in 20 sec for normal desktop. OpenSuse 12.2 uses SystemD is default boot/init system, which is much better. All major distros are switching to SystemD, except Ubuntu, which uses an inhouse alternate Upstart. Overall system performance is very good. I use KDE desktop, it is very responsive. OpenSuse team has worked hard to optimise KDE. The latest version of KDE at the time of release is 4.9, but included version is 4.8.4. KDE 4.9 is available in OBS repo, the reason for not including is that 4.9 is release time is too close to feature freeze date. I did not updated KDE for the time being. I’m using Kubuntu on my office laptop, but the KDE of Kubuntu is not as fast as OpenSuse. Overall I’m pretty happy with the improvements and performance of 12.2. It is must faster than 12.1 and also faster than Ubutnu 12.04. Majority of performance improvement comes from improvements in kernel and some base libraries. I’ve been using it since couple of weeks, I faced only one issue which is related AMD/ATI proprietary drivers. Recently AMD is splitted it catalyst driver, better knows as fglrx, into 2 versions, first is legacy version for Radeon HD 4xxx series and older gpu and another is for 5xxx series and higher graphics cards. Unfortunately I’ve both the cards on my laptop, the IGP of my laptop is 4250 and discrete graphics card is 5400 series card. I tried installing both version of driver but none of them worked for me. Let me know in comments if you find a way to make it work. 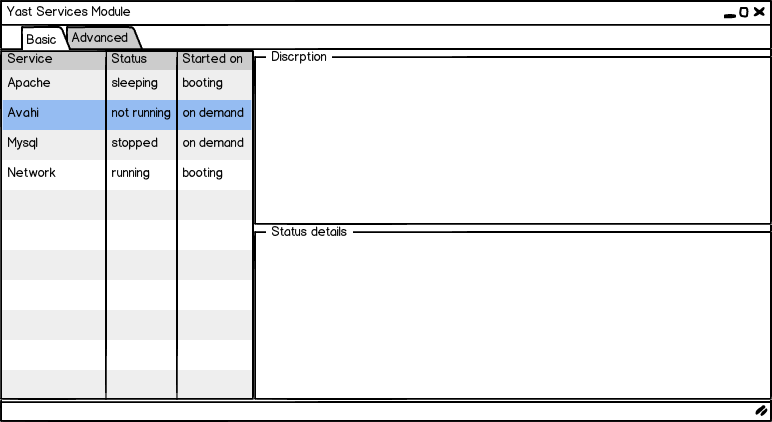 Here I'm posting an Idea to improve the interface to services module of Yast. Yast is the control panel like application in OpenSuse Linux. Yast is superb piece of software, I would say it is one of the best control panel among all OS available. The current services configuration module is not very user friendly, even simple mode is very confusion for the first time users. Other distributions have much better interface. We can borrow few things from other distros. Ubuntu services manager (USM) - The interface is too simple, does not show service running status. 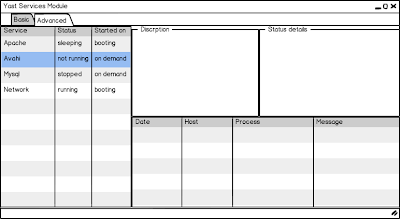 System-config-service (SCS) - The interface is user friendly, separate tabs for background services and on demand service, large area for description and status. Windows - Shows service status in list, option for delay start of services. I think we take few things each of theme. We can use USM interface for simple mode and SCS for advanced mode. Yast is a superb control panel application but not cool, now we should make it the coolest app so OpenSuse become much more easy to use OS.